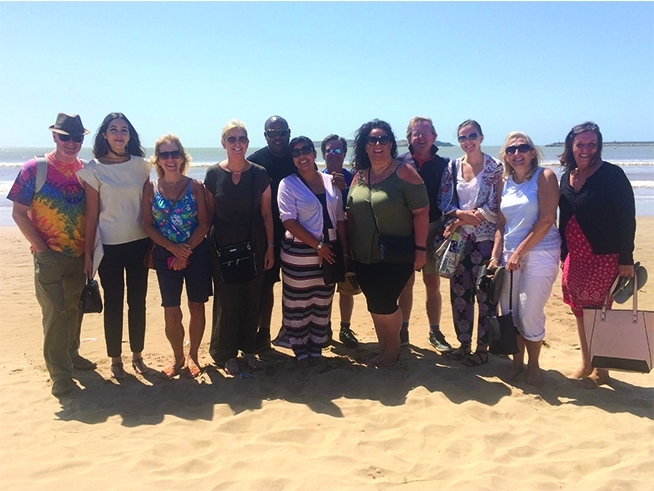 Cyplon Holidays recently hosted a group of nine travel agents including our wonderful Jean on a three-night fam trip to discover the contrasting landscapes of Morocco, with visits to Marrakech, the Atlas Mountains, and Essaouira. This wonderful trip combined hotel visits plus local attractions giving Jean and the group a real feel for all that Morocco has to offer. The group stayed at the Mövenpick Hotel Mansour Eddahbi & Palais des Congrès Marrakech. Following arrival at the airport and transfer to check-in at the Mövenpick hotel, Jean and the group headed to the first site visit at the IBEROSTAR Club Palmeraie Marrakech, where they had a buffet lunch and explored the all-inclusive hotel. Jean and the other members of the group were then treated to a tour of the Medina, souks and Djemaa El Fna, and the second hotel visit to Les Jardins de la Koutoubia. That evening was spent at the Chez Ali Show which included a traditional Moroccan tagine meal. Then the spectacle involving horses and the riders doing stunts while the horses were at full canter. It was certainly an eventful evening, and everyone thoroughly enjoyed themselves. After a goodnight’s rest and a hearty breakfast, the group departed to the Ourika valley in the Atlas Mountains to visit the Ourika Mountain Garden Valley, a boutique property. Whilst there, Jean and the other members of her group had a fun and informative cookery lesson to learn the traditional way of how to make a tagine. Jean is now our resident specialist at the art of cooking the Moroccan way! It was then time for a tour of Kasbah Angour Atlas Mountains Hotel in Tanahoute. This unique property was built under the direction of Englishman, Paul Fulham who is the owner and general manager. After returning to their hotel the team enjoyed a Mediterranean themed dinner at the hotel’s Medi Terra restaurant. Up bright and early for a trip to Essaouira, a port city and resort on Morocco’s Atlantic coast, a two-hour drive from Marrakech. The group had a guided tour of its medina (old town) which is protected by 18th-century seafront ramparts called the Skala de la Kasbah. After the tour the group had lunch and had the chance to visit some of the local hotels. The following day Jean and the group had to say farewell to Morocco, but it was not without some wonderful memories and great tips to share with her colleagues and customers.